Hello everyone! It's been a week since my last article, but I assure you that I was busy attending to important matters such as: the Kaijudo Winter Championships and of course, Thanksgiving. Speaking of which, I hope you all had a great holiday this past week! In this article I want to discuss the experiences that I had while in Texas, as well as my thoughts going forward into the next of four seasons of KMCs. I had never been out to Texas prior to this trip, but it was to my understanding that it was supposed to be warm... So much for that idea! The entire weekend it was cold and rainy, not exceeding temperatures of 40 degrees! This would eventually lead to flight delays, cancellations, you name it. Prior to my trip, I had to work a full shift leading up to my flight and I could already tell that it was going to be a long day. Once I had finally arrived in Texas, I was conveniently transported to the hotel by the local shuttle where I met up with my roommates and other Kaijudo duelists. The experience of finally being able to meet people in person that I had previously only spoke to online was amazing in itself and helped to push back the feelings of tiredness that I had. I had originally thought that there would be events going on Friday afternoon and continuing on into the evening. Instead it ended up just being a great opportunity to meet up with other players and playtest our deck ideas as well as our own personal tech choices for our decks. Going into the championship, I was already set on using [ccProd]Queen Kalima[/ccProd] as the focus of my deck, the question was, what's the best way to do so? I had recently been experimenting with [ccProd]Reverberate [/ccProd]and found it to be an amazing card, especially when you tend to throw out low level blockers to stop your opponent from getting in any early attacks in. The deck that I was most concerned about the entire weekend were the Water/Nature/Light Tempo decks. They just always seemed to get their progression going and I was stuck not being able to get Kalima out when I needed her to be on the board. I tried so many tech cards to deal with that threat and at one point I had almost convinced myself to use [ccProd]Shapeshifter Scaradorable[/ccProd]! Being able to turn my chump blockers like [ccProd]Grudge Weaver[/ccProd] and [ccProd]Skeeter Swarmer[/ccProd] into a 5000 power fast attacker seemed pretty good at the time, but it was hardly a proactive play as I was only dealing with their cards after they had gone in for an attack. I had eventually decided to revert back to a similar build that I had used at my local Duel Days event and I did a ton of testing with Sean Castor (Pogiforce), and some local Texas players including: Eric Arriola, Joe Kamelot, Tom Gulde, and even Bobby Brake himself! Probably one of my most notable memories from the weekend was when I was playing against Bobby Brake. Generally with the deck I was using, I wanted my opponent to go first due to the amount of discard in my deck, allowing me to gain more advantage in the long run. I won the dice roll and opted for Bobby to go first; he looked at me and said, "Pass..." I had never been so confused in this game until that moment. I drew my card for my turn and thought about what he was doing and joined in on the fun and awkwardly stated, "Pass?" Eric Arriola was cracking up by this development since I had apparently undid what Bobby had been scheming since the previous championship in the course of a few, very awkward seconds. From this point onward, I decided to call this move "The Arriola," and I would later use this against Matt Robinson and Corey Gaudreau, winning those games in the process. Check out Ryan Miller's signed play mat that he used in his Spell Slinging duels! Most of the day on Saturday was filled with Last Chance Qualifiers, Spell Slinging with the R&D crew from Wizards of the Coast, and a new format for Kaijudo, "Booster Brawl." I also had the amazing opportunity to be interviewed by YouTube personality Carl Reddish AKA Thundersultan. I personally had a great time with the Booster Brawl format since it added a new feel to the game while keeping all of the same aspects the players love about the game as well. Being able to essentially manipulate what your opponent takes from the "Veil" or knowing what they have in their hand due to their veil pick was an enjoyable feature. To make matters more interesting, they introduced three new promo cards into the mix as well. All of which had very interesting mechanics that thrived in the sealed environment of the Booster Brawl. Everything from manipulating the deck and drawing, to fast attacking and gaining mana, and sending a creature back to the deck so you can use it later! Believe it or not, one of the best cards that I used all weekend at the Booster Brawl was Predict! This card single-handedly set up your draws and what your opponent would be drawing for the next two turns! Overall a really enjoyable experience in itself that I am excited to be released once February hits. 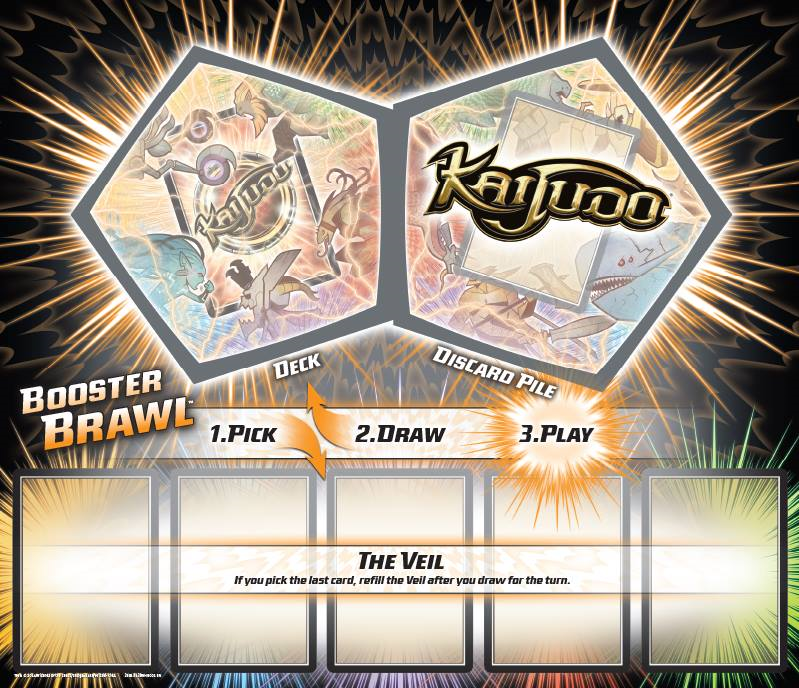 Make sure to check out Booster Brawl when it hits your local hobby shop this February 2014! The main idea of the deck was to strip away resources from my opponent as early as possible and leave them throwing every card they would draw from then on into mana. This strategy would allow me to get to my late game plays of [ccProd]Queen Kalima[/ccProd] as long as I could draw into it. Since this would also be wearing away at my resources as well, I would always opt my opponent to go first to allow them to have less cards to work with. The only time this was really problematic is when they would get out a turn two Cyber Scamp. To balance the deck out, I used four non-darkness cards: two [ccProd]Crystal Memory[/ccProd] and two [ccProd]Reverberate[/ccProd]. The idea was to get one of these off on turn six to allow me to refresh my hand and dominate the late game, all while keeping consistency high for Kalima and [ccProd]Mark of Kalima[/ccProd]. Since I decided to be more of a passive player in the early game, I felt that the need for cards like [ccProd]Scavenging Chimera [/ccProd]were less needed. 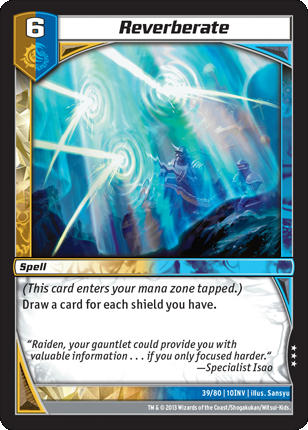 This also opened up the opportunity for me to freely charge whatever mana I wanted into my mana zone without locking away the "Heart of Darkness" ability of Scavenging. A great deal of my turn progressions allowed me to hit my opponent with a turn two[ccProd] Specter Claw[/ccProd], a turn three [ccProd]Mesmerize[/ccProd] or Claw, and a turn four [ccProd]Spire Puppet[/ccProd]. If that wasn't enough, I had multiples throughout the deck access to a single copy of [ccProd]Maddening Whispers[/ccProd], a set of [ccProd]Grip of Despair[/ccProd], and even a lone teched in copy of [ccProd]Veil Stalker[/ccProd]. After the championship and looking back at my performance as a whole, I would have liked to have included more powerhouses for the late game. When playing against Tom Rogers, I barely saw [ccProd]Queen Kalima[/ccProd] in all of our three games! In one of our games, I had played [ccProd]Crystal Memory[/ccProd] into [ccProd]Reverberate [/ccProd]leaving me with only two non-dark cards in my deck. I later attempt to play [ccProd]Mark of Kalima[/ccProd] to banish his two [ccProd]Lyra, the Blazing Sun[/ccProd] and I hit one of those two cards off of the deck! To top things off, I later played [ccProd]Squillace Scourge[/ccProd] and opted to not swing in for shields (when I clearly should have) and passed in an attempt to draw an answer to his board state since I ran so many. In the process, there must have been a communication error, because he attacked me when Squillace's effect should have been active. That's my fault just as much as Tom's and didn't help my situation as he was able to get rid of a blocker of mine as well. I was kicking myself after actually watching the video coverage of our match...it won't happen again guys! I played against a lot of great players throughout the day including: Zach Bird, Eric Arriola, Matt Robinson, Tom Rogers, Corey Gaudreau, and Carl Miciotto. My only losses throughout the day were to Carl and Tom who finished the day at second and third place respectively. Overall, Kalima was able to get me where I needed to be, when I saw her. Most of the time my deck did what I wanted it to do, but it did stall out against Tom Rogers and I was left grasping for options against Carl Miciotto's tempo build. There's always room to improve on when working on a deck and when determining what tech choices or meta calls are the right call, but for now, it looks like I'll have more than enough time to develop new strategies that I can hopefully utilize at the next season of KMCs. After the end of the six rounds of swiss, I was sure that I was going to still squeak in at the top eight seeing as I was in third place going into the last round. Apparently it just wasn't in the cards for me though, as losing my last round against Carl pushed me down six spots to ninth place! On a positive note though, I was awarded the "Spirit Award," which is given to those who have great sportsmanship, enjoy the game, and support the community among many other factors. This award included a signed full art version of [ccProd]Almighty Colossus[/ccProd] and an iPad Mini! - Wizards of the Coast for hosting such an amazing event with live coverage, free packs, the prize wall, R&D Spell Slinging, etc! - Alter Reality Games and Jim McMahan for vending at the event and giving me the opportunity to be a part of ARG. - Getting to meet all of the players from the Facebook Dojo and YouTube. - Rob Gruber for hooking me up with some Good Times Games swag. Go Canada! - Bobby Brake, Eric Arriola, and Sean Castor for giving me a place to stay for the weekend. - Meeting up with Christian Van Hoose at the airport during a delay. - Being interviewed by Carl Reddish and having a feature match. - Not attacking when I had played [ccProd]Squillace Scourge[/ccProd] against Tom Rogers and then him attacking me when Squillace's effect was active. - Hitting a 1 of 2 non-dark cards left in my deck off of [ccProd]Mark of Kalima [/ccProd]when I needed it to hit two. - Getting 9th Place due to tie breakers regardless of being 3rd place going into the final round. - Having to work the night before my flight and not getting any sleep. - Rushing to the airport only to find out that my flight was delayed a couple of hours. - Drawing five cards off of [ccProd]Reverberate [/ccProd]and not seeing a single Kalima. Until next time everyone, this has been Mark Woodin, and as always, remember to keep calm and game on!